Somen with fresh tomatoes and cucumbers! Summers in Japan are known for one thing – sweltering humidity! Famous cities like Tokyo and Kyoto are much farther south, and so they get the brunt of the heat, but Iwate and the rest of Tohoku get pretty hot June through August. Modern buildings are fully equipped with air conditioning, but you’ll have to supply your own AC unit for older housing (personally, I get by with open windows and a fan). However, there’s one refreshing dish you can use to help yourself get by: cold noodles! 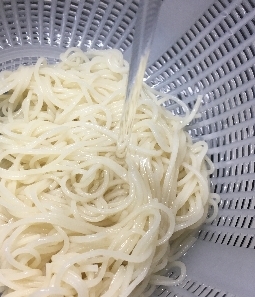 There are a bunch of cold noodle dishes in Japan, but by far the cheapest and most available cold noodle is called “somen.”* Somen literally means “simple noodle” in Japanese, and is a thin white noodle made from flour. It’s not chewy or springy like ramen, but it’s extremely refreshing when eaten with cucumber in a chilled broth. -and anything else you might like! 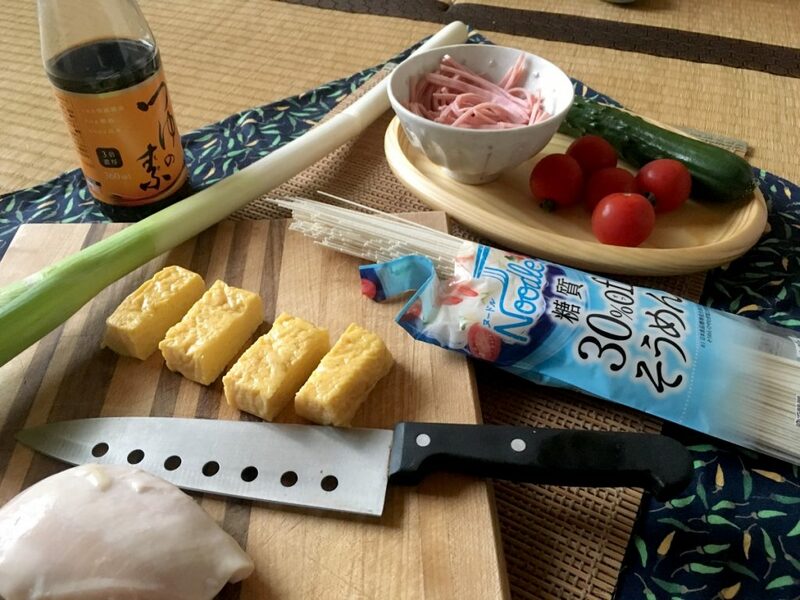 You can buy somen and related ingredients at literally any Japanese grocery store or convenience store! Here’s my trip to the local store behind the Iwate Prefectural Office (haha). 1) Boil the somen noodles. They usually cook very quickly, in about 2 to 3 minutes. 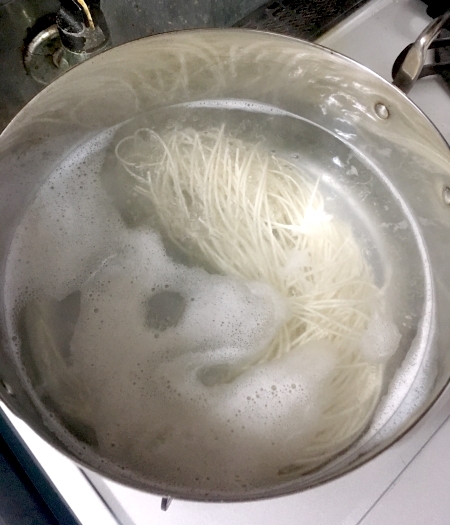 2) Drain the noodles and rinse them in cold water. 3) Mix equal parts mentsuyu and water in a bowl, and place your noodles and any toppings in the bowl. You’re done! I like to add ice cubes to cool it down further. 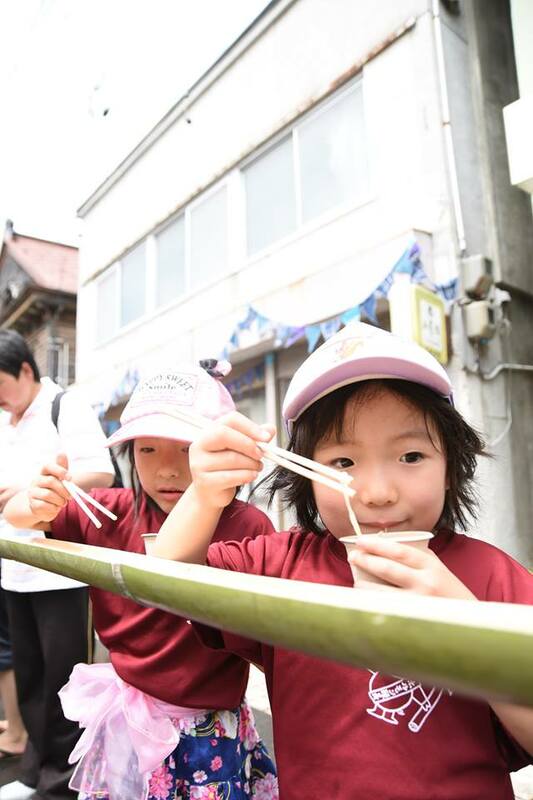 A bowl of somen can be made in basically five minutes, but there’s a variation called “nagashi somen.” A long flute made out of bamboo is placed outside, with clear, fresh water running down it into a bucket. Fresh somen is then placed in the flute, and people try to catch it with their chopsticks. It’s a pretty fun activity, especially with kids! Please like Ryusendo Cave on Facebook! 素 is used in another word that be very familiar to you particle physicists out there!